When one of my friends asked me to recommend him a pair of shoes to match with a green suit, I was a little bit in doubt. Knowing him as an unconventional person, I was a bit surprised to find out that he really wanted to dress smart. So, after a bit of thinking and matching different outfits in my head, I found the right pair for him. 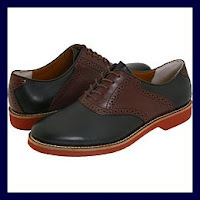 The Bass Burlington classic oxford shoes in two-tone leather are a bit different of the rest of the shoes due to the unusual colors. They’re the perfect ‘be different’ pair of shoes to match a business outfit.